Adapts to changing supply voltage, frequency and lamp conditions. INTERNATIONAL Rectifier has released the IR2520D compact fluorescent lamp (CFL) ballast control IC. It can adapt to changing supply voltage, frequency and lamp conditions to increase lamp life and reliability. All necessary ballast features are integrated into a single 8-pin DIP or SOIC, reducing parts count, simplifying circuits and increasing reliability. The IR2520D is a complete ballast controller and 600V half-bridge driver for CFLs. It includes a zero voltage switching (ZVS) circuit that maintains soft switching, regardless of supply voltage, frequency and lamp conditions. It also includes internal crest factor over-current protection and an integrated bootstrap diode. At the heart of this IC is a voltage-controlled oscillator (VCO) with an externally programmable minimum frequency. 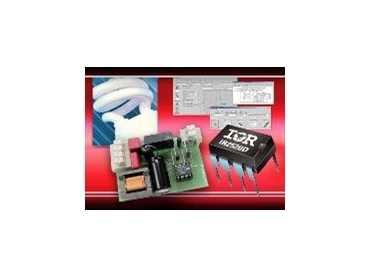 The IR2520D is based on IR's high-voltage junction-isolation (HVJI) IC technology. This allows high-voltage circuits to be isolated from low-voltage circuitry, so that both high-side and low-side drive functions can be housed on a single chip for controlling various switching converter topologies. Since lighting ballasts require both high-voltage and low-voltage circuits to function, components made with the technology are particularly well-suited to the application. A key feature of the IR2520D is its adaptive zero voltage switching control. During each half-bridge switching cycle, half-bridge voltage slews to the opposite rail during deadtime. If the voltage has not completely slewed to the opposite rail so that there is zero voltage across the appropriate switch before turn-on, then the operating frequency is too close to resonance and the frequency increases. The built-in adaptive zero voltage switching (ZVS) and zero current switching (ZCS) closed loop control matches operating frequency as close as possible to the half-bridge output stage resonance. Operating a ballast in ZVS/ZCS mode minimises switching losses in the half-bridge MOSFETs, ensuring maximum efficiency and lifetime, regardless of component and lamp tolerances as well as line voltage variations. The IR2520D features fault and protection circuitry. An open filament lamp fault will cause hard-switching at the half-bridge, and the non-ZVS circuit or the crest factor circuit will detect this condition and will enter fault mode, and both gate driver outputs will be latched low, turning the lamp off. If a lamp non-strike condition occurs when the filaments are intact but the lamp does not ignite, the lamp voltage and output stage current will increase during the ignition ramp until excessive currents occur or the resonant inductor saturates. The IR2520D has an output drive capability of 250mA/400mA, 15.6V Zener diode clamp on Vcc, micropower startup current and built-in 30kHz to 125kHz oscillator.